I am very honoured and proud (and slightly late!) in revealing my designs for two new gardens at the new Centre for Horticultural Science and Learning on the Hilltop at RHS Garden Wisley RHS. 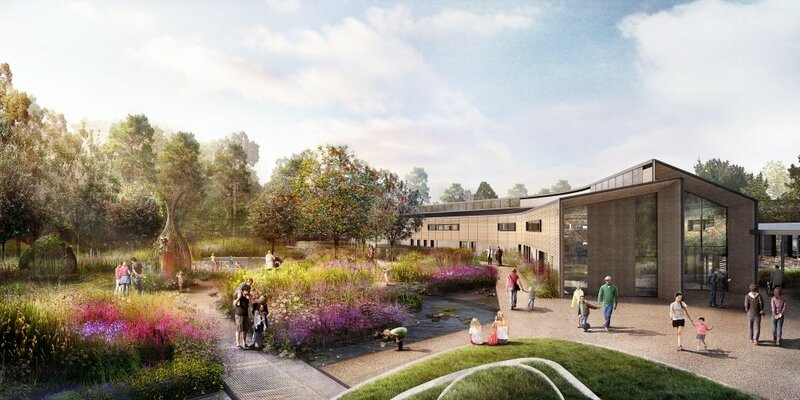 Both The Wildlife Garden and World Food Garden will form ‘living laboratories’ when they open in Spring 2020 and play an important part in the enhanced learning experience by illustrating how plants impact our daily lives. The Wildlife Garden shown here draws inspiration directly from the physical world. The energy of nature and the way it is delivered and enjoyed by the world’s populations were key to our design process, as was the representation of familiar natural environments of the British Isles (wetland, woodland, meadow, mountain etc.). The original design layout was inspired by movement, energy and light, and the structure of a bee wing evolved to include ‘segments’ of garden, none of them too large, in which a visitor could readily associate their own garden space. All life is supported by water, and it is arguably the single most useful element in attracting wildlife into the garden. It was important to our design that we embrace water in various forms – from a large body of water at the garden’s main entrance, a smaller double pool at the heart of the garden useful as an educational resource to explore the flora and fauna found beside (and within!) bodies of water, right down to rainwater bowls in our smallest garden zone. Water also reflects, meaning that the sky and all it contains becomes a borrowed landscape in the nature garden. There is an area of natural stone jetties, and a contemporary bird hide from which to gain a different perspective of all the flora and fauna that the garden contains. The paths, all wheelchair accessible, become rivers of movement within the garden, which encourage exploration to all corners of the space. Sections of steel grid float above low pools of planting where one becomes just like a hovering beneficial insect. The rest of the paths, or ‘human wildlife’ corridors allow one to wander through areas of foraging hedges, and educational, but alluring features to enjoy and inspire.